Since 1958 the Weikert Family has been producing farm fresh eggs for Gettysburg and surrounding areas including Emmitsburg, Thurmont, and Fredrick, Maryland. The farm provides eggs to numerous restaurants and markets in the region. Customers can visit the store located on the farm, or can inquire about delivery to their home or business. Our chickens don't live in cages! Instead they roam free in the rooms of the chicken house. They enjoy natural sunlight and a diet of corn, soybeans, alfalfa meal, vitamins and minerals. Beef has been raised on the farm since 1834, and is available for sale exclusively at the farm store. Customers interested in large quantities of beef can order a whole, half, or quarter. Call the farm for custom orders at (717) 334-3727. 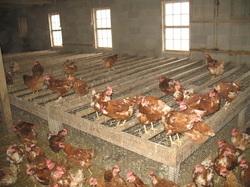 Chickens on the farm enjoy plenty of natural light and can walk freely within their rooms.